The Nelson Bell Bubble Pendant is part of the Nelson Bubble Lamps, a series of lamps in elegant, spherical silhouettes. 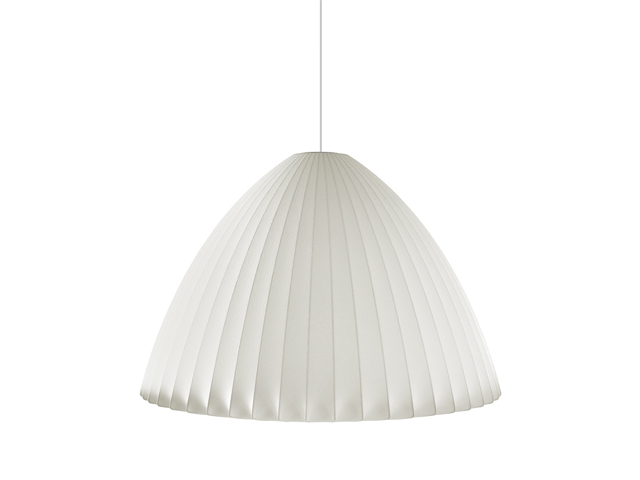 This extra-large light fills a space with soft, diffused light as it floats overhead, hung from a steel ceiling plate. George Nelson originally designed the series in 1952. The Nelson Bell Bubble Pendant comes in one size, extra-large, along with a brushed nickel-plated steel ceiling plate and a 9-foot cord. Fashioned from a sturdy, lightweight steel frame, its bell-shaped lampshade has a graceful presence as it illuminates the space around it. In 1952, George Nelson was impressed by a set of Swedish hanging lamps, but their prohibitive price prompted him to design his own. The result was a timeless collection of lamps that complement contemporary interiors as easily and beautifully today as they did mid-century homes.